First of all, the Austrian scene was, like any international computer scene, mostly based on the mainstream computer systems. Those were (in historical order): the legendary Commodore 64, the Amiga (which will be remembered as the first ever multimedia computer - which was far ahead of its time), and last, but not least, the IBM compatible (nowadays mostly referred to as the PC - which started its unbreakable success with the first home user soundcards available, like the AdLib soundboard and all that followed). Those three systems were the main field of activity of subcultures calling themselves the computer scene. Besides these, there have been a few people active on CPC, 8bit Ataris, 16bit Ataris and not to forget the various game consoles. While the scene started elsewhere in Europe, mainly with the release of the Commodore 64, Austria was still sleeping in 1983 and 1984. The first activities to mention were registered in 1985, when individuals started to write tools and crack games which they imported from the UK or bought at local shopping malls. They swapped their stuff at schools and soon started swapping by mail with people from all over Europe. While the first people in Austria started to form groups in order to be more successful in 1986, it was not before 1987 that groups - which would be well known later - were founded. I would even say, the real Austrian scene did not get started until 1987, but from this year on, a lot of things happened. Numerous groups were found on C64, names like MegaForce Crackings (MFC), The Softkiller Crew (TSK), The Voice (TV), The Austria Crew (TAC), The Nibbly Industries (TNI), The Crack Machines (TCM), Cracking Institute Austria (CIA), Soft Tiger Crew (STC) and many more. Lloyd from Salzburg founded The Austrian Union (TAU) which will become the biggest Austrian group ever, including groups like MegaForce, TSK-Crew and The Voice (in later years) as subgroups. The group was so famous and well known that people from other countries joined up with The Austrian Union. Many from Germany, but also Finnish Gold became a part of TAU for some time - thus the name was extended to The Austrian Union International. MF joined TAU (1986) by Megaforce Crackings and The Austrian Union. 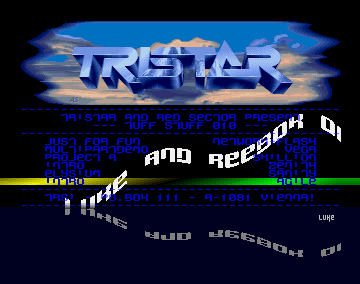 At that time TAU was the untouchable number one group in Austria, not only releasing fast and working cracks, but also releasing the first impressive program code - early demos if you like - which included bordersprites and full screen pictures. Around the same time the legendary 1001 Crew from the Netherlands became famous for their bordersprite demos. Groups like MegaForce and The Softkille Krew (TSK or TSK-Crew) also started on the early Amiga scene in 1987. When the scene started it was mainly a local thing. Individuals releasing and swapping programs at school or the nearest computer club. Soon they started to team up and form groups which - if at all - got only famous locally: Input, Vienna Soft, Vienna Cracking Service, Softguru & Bodosoft. In 1986/87 people in the same group mostly all came from the same country, but in 1987/88 the first groups started to appear that had sections in different countries. 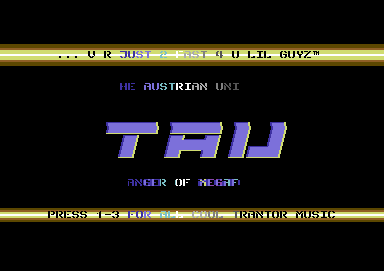 When The Austrian Union's founder Lloyd switched to Amiga and became a member of MegaForce in 1987, most C64 members of TAU became independent. "WHILE THE SCENE STARTED IN EUROPE MAINLY WITH THE RELEASE OF THE COMMODORE 64, AUSTRIA WAS STILL SLEEPING IN 1983 AND 1984"
Lots of groups switched to the Amiga and new ones emerged: The Professionals, Mygon Association and Amigavision were the newcomers of 1988. The leading groups of this era were without a doubt Megaforce and TSK-Crew. Later this year the Mygon Association and The Professionals joined forces to form The Quest. The Megaforce, TSK-Crew and Quest Copyparty took place in Salzburg in October. Visitors needed to have a personal invitation. It was the first big copyparty in Austria with lots of international attendees. 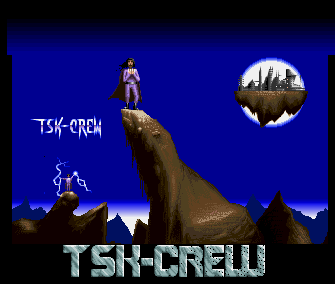 The C64 section of TSK-Crew became its own group by the name of Cosmos, which was the leading group on C64 at that time. 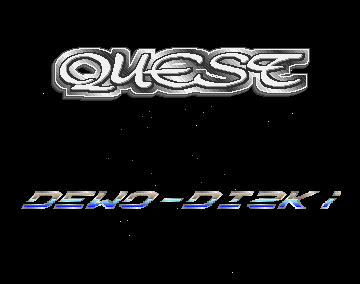 Demo-Disk by Quest, released at the Megaforce, TSK-Crew and Quest Copy Party in 1988. Finally, in 1989, the high times of the Amiga scene started. New names from Austria on the screen included Subway, the new name of The Quest, Scoopex, the new name of Megaforce, Energy, and Savage. C64 groups like the Soft Tiger Crew and The Crack Machines founded Lazer. And as more and more groups started to become international with sections around the world, many Austrian sceners joined foreign groups like: Commando Frontier (CFR), Pulsar, Weird Science, and so on. 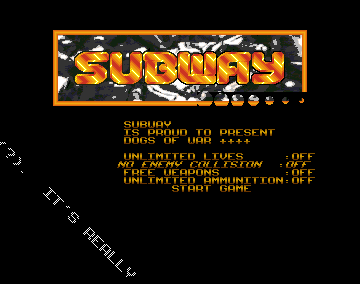 Dogs of War by Subway in december of 1989. At this point lots of sceners already used modems to spread their releases, bringing in the Americans, who didn't want quality, but fast releases. While there were already software copyright laws in France, Germany and the UK, the rest of Europe including Austria still enjoyed swapping and spreading cracked games without consequences - and this continued to go on for some time in the same way. When Cosmos (C64) died officially, the demosection continued under the name Cosmos Designs and showed off by releasing awesome demos and games. Many copyparties had been held that year, at least one a month, but many of them had barely more than 50 visitors and more than likely very little party-folk from abroad. Phenomenon (1990) by Cosmos Designs. In 1990 the small Austrian group Stormtroopers of Death (SOD) split up into X-Ray and Grace, of which the latter would become quite a large and active international group. The Austrian Commando Frontiers also switched to the Amiga that year, just to join the forces of Scoopex a short while after. Also Manitou and Leprosy spread their first releases. On the C64, Lazer died, and most members built up the Austrian section of the Depredators. The groups A-Team and Army had a successful cracking cooperation and Chaos released their only impressive demo. The 72-Multiplexed Sprites by Chaos, released in may of 1990. The year 1991 brought a major change in the Austrian scene. Many Scoopex members left to form the new Austrian section of Rebels, together with new talents from the small groups Infinity, X-Ray, and Tardex on Amiga and PC-PoWeR on PC. But it should become a quite short intermezzo, because they built up the Austrian section of the newly founded Tristar & Red Sector Inc (TRSI) cooperation. Surprise! Productions (S!P) were introduced the same year to be the Austrian demosection of TRSI. The Atari group Lazer, with C64 roots, had their first release on Atari ST and many more on ST and Falcon would follow, which made them an internationally well known Atari group. Tuff Stuff, an Austrian packdisk carried over from Rebels to Surprise! Productions in the course of 1991. After S!P left TRSI in 1992, the Amiga section became a subgroup of Scoopex and the PC section became a subgroup of International Network of Crackers (INC). This was only for a brief time, before both sections reunited and became an independent group of their own with S!P PC presenting their first impressive demo on PC. When Depredators (on the c64) died the Austrian members built up Varsity, which became a very active and well known group for a period, until its founder and gifted coder Charlie died a year later in a tragic car-accident on the way to The Computer Crossroad party in Sweden. That was a black day in Austrian scene history. "DEPREDATORS' FOUNDER AND GIFTED CODER DIED A YEAR LATER IN A TRAGIC CAR-ACCIDENT ON THE WAY TO THE COMPUTER CROSSROAD PARTY IN SWEDEN - A BLACK DAY IN AUSTRIAN DEMOSCENE HISTORY"
Saxon's End by Varsity, released in may 1992. The last big notable party took place in Austria in 1993, namely the SEMI'93 (Scoopex-Energy-Manitou-Innsbruck party) with many visitors from all over Europe. The Austrian scene started to become smaller and smaller at that point. Real life started to catch up with many sceners. Most Austrian groups also stopped their illegal activities because on January 1st, 1993 software copyright was introduced by the leaders of all of the Western European countries. While on Amiga, Energy and Manitou spread their last releases in 1994. On the C64 a new group was born: The Remembers. Shortly afterwards, in 1995 to be precise, they renamed themselves to Nostalgia. Surprise! Productions silently faded away from the Amiga and PC scene. "MOST OF THE AUSTRIAN SCENE FADED AWAY BEFORE THE END OF THE MILLENNIUM"
And in the late 90's the only active Austrian groups were Scoopex (Amiga until 1998, PC until 1999), Lazer (Atari, until 1999) and Nostalgia (C64, still active until 2007!) with a guest appearance of Riot (PC) in 1996. That meant that most of the Austrian scene faded away before the end of the millennium. Luckily in 2002 a new sign of Austrian scene talent showed up, when Speckdrumm introduced themselves. To date, Speckdrumm is the only Austrian demoscene group worth mentioning as being active. 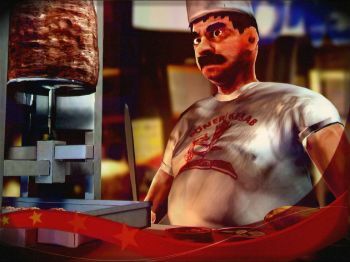 Tayfur 2: Turkish Delight by Speckdrumm, released at The Ultimate Meeting in december 2007.